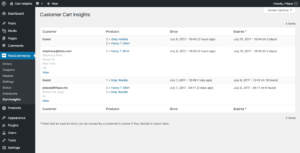 Cart Insights is a WordPress plugin for WooCommerce that provides an instant overview of your shop's current customers and the contents of their carts. Already own Cart Insights for WooCommerce and need help? Click here for support and documentation. What is the required WordPress version to run this plugin? What is the required WooCommerce version to run this plugin? Where do I view the carts? How do I toggle table column visibility? How do I change the amount of table rows per page? How do I find a specific user's cart? After activating the plugin, visit WooCommerce > Cart Insights. There you’ll find a table view of all active cart sessions. While viewing the cart table page, click “Screen Options” on the right-top of the screen to change which columns are visible and how many rows are shown per page. How do I find a specific user’s cart? When you visit the Users page you will find a new column in the user table that shows the specific user’s cart contents if there are any. Changed the default user role neccessary for viewing Cart Insights from "edit_theme_options" and "manage_woocommerce" to "view_woocommerce_reports". The role is filterable with the hook "wccci-admin-capability". Added the user role(s) to the customer information when they are registered users. Now properly showing the relevant product variation(s) in a cart's product list when applicable. Now also showing a product's attributes in a cart's product list when applicable. Now showing cart (sub)totals in the products column. Updated column widths to provide a bit more space for the Products column. Added a search field above the cart listing table to allow for searching for a customer's name or email address. The cart column in the Users table.